If you are like most people, willpower and self-regulation may not exactly be among your top strengths. E.g., for most of us, self-regulation is located pretty close to the bottom of the list when filling in the VIA questionnaire on 24 character strengths – which is based on Seligman´s and Peterson´s book Character Strengths and Virtues. But then, breaking or making habits is one of the most important tasks when trying to succeed at a personal change project. So lo and behold! There´s help on the way. In earlier days, people would tie a knot in their handkerchiefs to help them remember things. These days, people don´t use handkerchiefs that much – but most of us do have a smartphone (or two…). And of course, there´s lots of apps around that strive on the fact that our spirit is willing but the flesh is weak. OK. The Good Habit Maker is a nice little (free) app that does only one thing: at pre-selected intervals over the day, it’ll push one sentence to your smartphone´s screen, e.g. your personal change mantra. Helps a lot to bring your mind back to what you want to achieve during busy schedules. 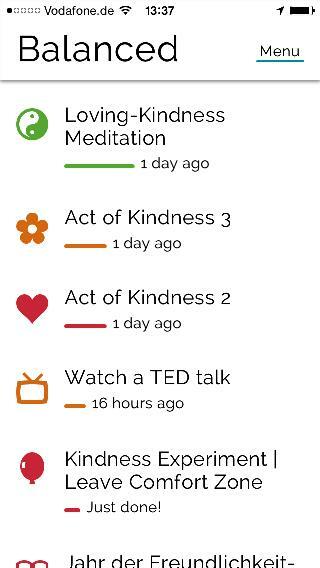 The app Balanced is a little more refined, it´s a sort of task manager. You can enter specific tasks that you want to accomplish, and the quantities/intervals you intend to fulfill (e.g., “watch a TED talk once a week”). 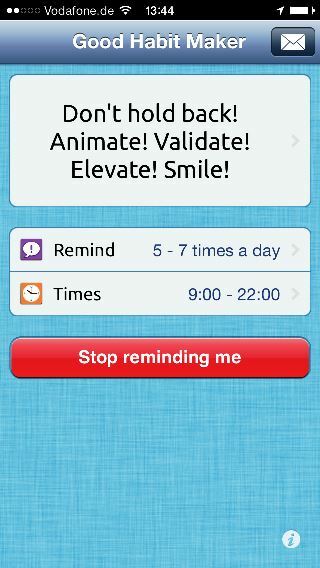 The app will then continuously remind you to complete those tasks until they are done. It also keeps track of you levels of completion and timeliness. There´s a demo version that is limited to a small number of tasks – the full version comes at $ 2.99. And finally, the Grid Diary: as the name suggests, it´s a nice and clean diary app. The useful twist: you can pre-select (or enter your own…) specific questions. So instead of having to think about what to write each and every evening, the app will make you respond to the prompts that you specifically chose to be given. By way of example, I use it as a gratitude journal, which is one of the pre-eminent interventions in Positive Psychology. It´s free but offers some in-app purchases. Enjoy! Keep it going! And for some extra energy, power up your Sisu!